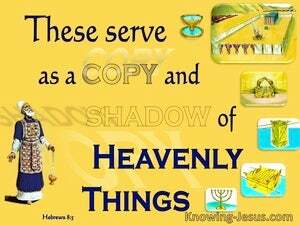 ﻿ Hebrews 8:5 who serve a copy and shadow of the heavenly things, just as Moses was warned by God when he was about to erect the tabernacle; for, "SEE," He says, "THAT YOU MAKE all things ACCORDING TO THE PATTERN WHICH WAS SHOWN YOU ON THE MOUNTAIN." They serve in a sanctuary that is a copy, a shadow of the heavenly one. This is why Moses was warned when he was about to build the tent: "See to it that you make everything according to the pattern that was shown you on the mountain." who serve that which is a copy and shadow of the heavenly things, even as Moses is warned of God when he is about to make the tabernacle: for, See, saith he, that thou make all things according to the pattern that was showed thee in the mount. These priests serve [in a sanctuary] that is [only] a copy and a foreshadow of the heavenly one. Now Moses was warned [by God] when he was about to build the Tabernacle, for God said [Ex. 25:40], "See that you make everything according to the pattern that was shown to you on the mountain [i.e., Mount Sinai]." and these serve the copy and shadow of heavenly things, as Moses was admonished of God when he was about to make the tabernacle: See now, says he, that you make all things according to the pattern shown you in the mount. Being servants of that which is a copy and an image of the things in heaven, as Moses, when he was about to make the Tent, had special orders from God: for, See, he said, that you make everything like the design which you saw in the mountain. They serve a copy and shadow of the heavenly sanctuary; for when Moses was about to erect the tabernacle, he was instructed by God, saying, "See that you make everything according to the pattern which was shown you on the mountain." and officiate in the sanctuary, which was a gross representation of that in heaven, agreeable to the order given by God to Moses, when he projected the tabernacle, "be very exact, said he, in following the model which was laid before thee in the mount." Who serve after the pattern and shadow of heavenly things, as Moses was admonished of God, when he was about to make the tabernacle; for, saith he, See thou make all things according to the pattern which was shewed thee on the mount. Who serve the pattern and shadow of heavenly things, as Moses was given an intimation of the divine will, being about to complete the tent: for, See, says he, thou make all things according to the type shewed thee in the mount. Who serve unto the example and shadow of heavenly things, as Moses was admonished of God when he was about to make the tabernacle: for, See, says he, that you make all things according to the pattern showed to you in the mount. who serve a sketch and shadow of the heavenly [things], just as Moses was warned [when he] was about to complete the tabernacle, for he says, "See to it that you make everything according to the pattern which was shown to you on the mountain." who serve the example and shadow of heavenly things, as Moses was warned of God when he was about to make the tabernacle. For, He says "See that you make all things according to the pattern shown to you in the mountain." which priests serve unto the example and shadow of heavenly things: even as the answer of God was given unto Moses when he was about to finish the tabernacle: "For take heed," said he, "that thou make all things according to the pattern showed to thee in the mount." (men who serve a mere outline and shadow of the heavenly ? 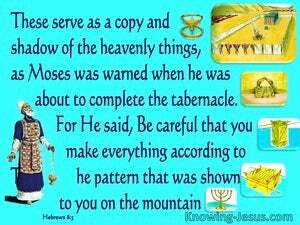 ?as Moses was instructed, when he was about to execute the building of the tabernacle: see, God said, that you make everything on the pattern shown you upon the mountain). The place where they serve is a sketch and shadow of the heavenly sanctuary, just as Moses was warned by God as he was about to complete the tabernacle. For he says, "See that you make everything according to the design shown to you on the mountain." who serve a copy and shadow of the heavenly things, even as Moses was warned by God when he was about to make the tabernacle, for he said, "See, you shall make everything according to the pattern that was shown to you on the mountain." who serve the mere delineation and shadow of the heavenly things, as Moses was admonished by God when he was about to make the tabernacle; for, "See," saith he, "that thou make all things according to the pattern which was shown thee in the mount." Who, indeed, are rendering divine service, with a glimpse and shadow, of the heavenly things; even as Moses hath received intimation, when about to complete the tent, - For see! saith he - Thou shalt make all things according to the model which hath been pointed out to thee in the mount. who perform the service after the figure and shadow of things in the heavens, as Moses was divinely instructed, when he was about to finish the tabernacle. "For see," saith God, "that thou make all things according to the model shewed thee on the mount." Who serve to the example and shadow of heavenly things, as Moses was admonished by God when he was about to make the tabernacle: for, See (saith he) that thou make all things according to the pattern shown to thee in the mount. and serve a copy and type of the heavenly things, just as Moses was divinely instructed when about to build the tabernacle. For God said, "See that you make everything in imitation of the pattern shown you on the mountain." and yet they officiate in a sanctuary that is a mere copy and shadow of the heavenly one, as Moses, when he was about to make the tent of worship, was warned, for, said He, "See to it that you make it all just like the pattern shown you on the mountain." who worship under the representation and shadow of heavenly things; as Moses was ordered by God, when he was about to finish the tabernacle. For see, saith He, that thou make all according to the model shewn thee in the mount. 4 Now if He were on earth, He would not be a priest at all, since there are those who offer the gifts according to the Law; 5 who serve a copy and shadow of the heavenly things, just as Moses was warned by God when he was about to erect the tabernacle; for, "SEE," He says, "THAT YOU MAKE all things ACCORDING TO THE PATTERN WHICH WAS SHOWN YOU ON THE MOUNTAIN." 6 But now He has obtained a more excellent ministry, by as much as He is also the mediator of a better covenant, which has been enacted on better promises. Now this was the workmanship of the lampstand, hammered work of gold; from its base to its flowers it was hammered work; according to the pattern which the LORD had shown Moses, so he made the lampstand. "All this," said David, "the LORD made me understand in writing by His hand upon me, all the details of this pattern."